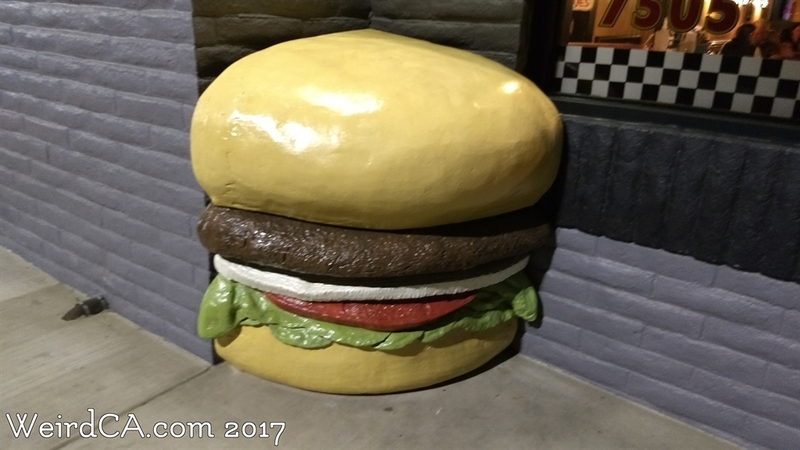 One would expect that in a state the size of California that there were be more giant hamburgers. But there's only two. That's right there's over thirty giant roosters lying around the state, many at various chicken restaurants, but only two giant all beef hamburgers! There are just as many giant hot dogs in the state as giant burgers. 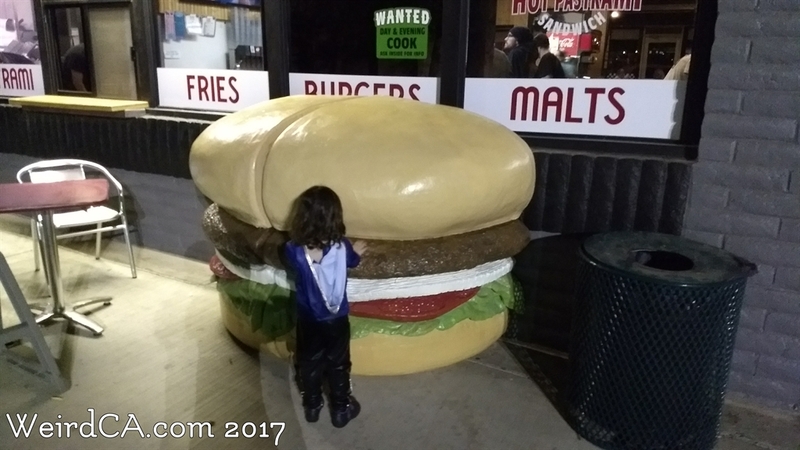 One of the giant burgers is in Atascadero. 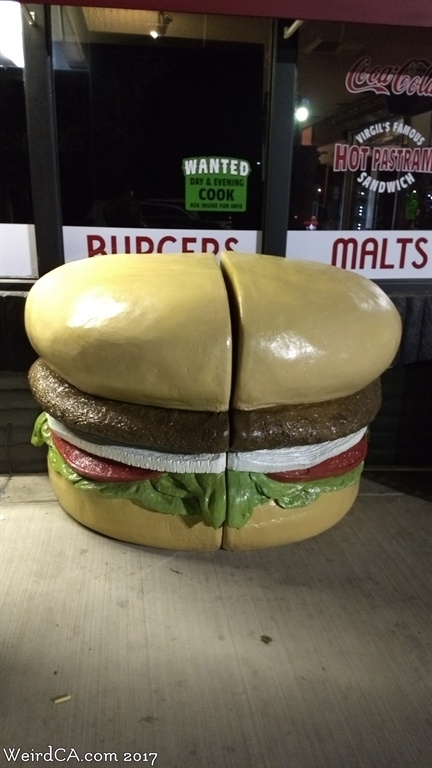 Located at A-Town Diner, the burger is actually separated into three pieces. There are two quarter burgers and one half burger spread around the restaurant. The half burger is near some outdoor dining, while the two quarter burgers are located at the front and back doors. It's like someone decided my daughter was going to eat the burger and cut it up into more manageable pieces. The second giant burger is down in Los Angeles at a place called Sam's Tacos. That's right, a taco place, not even a burger place. At least the diner in Atascadero serves up a bunch of burgers. Course, one of the giant hot dogs in California use to hang above a Thai restaurant before moving to its current location, so who are we to argue with a burger on top of a taco place. The giant burger here is on top of the outdoor dining and is joined by a giant soda and a giant set of french fries, for a complete value meal! At one point there were two more sets of giant burgers / fries / soda exactly like the set at Sam's Tacos. They were located at TV Cafe, also formerly in Los Angeles, and Carnitas Michoacan #3 which was literally around the corner from Sam's Tacos, but closed sometime in 2016. 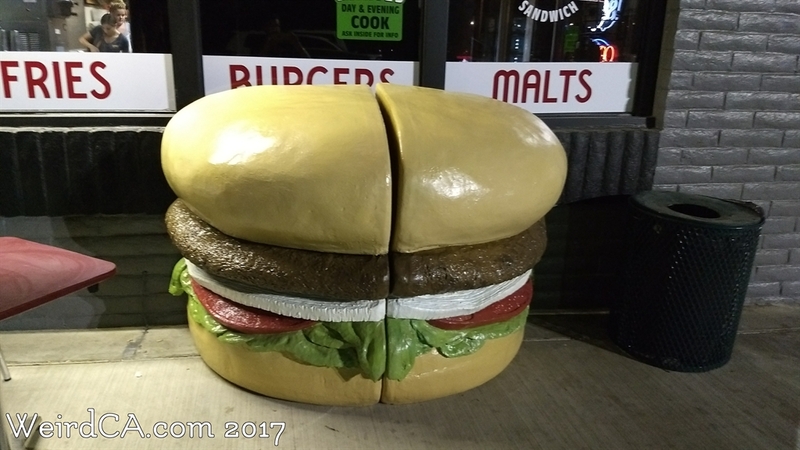 There are supposedly some giant burgers in the Valley Relics Museum. These burgers were used as a prop in the 1988 movie, Miracle Mile. I haven't, yet, seen these burgers. Speaking of giant hot dogs, the old Tail o' the Pup hot dog stand is supposedly also in this collection, with the burgers and hot dog both being in the North Hollywood storage lot for the Chatsworth Museum. I have also seen (only two) pictures of double stacked giant burgers in Catalina. Both burgers have two patties, and one is stacked on top of the other. I believe they are located in Avalon Beach, but I am unsure of which business they can be found outside of. Lastly, if you're in Las Vegas, there is a giant combo meal consisting of a giant burger, soda, and fries outside Checkers Burgers on Paradise Road, west of UNLV.